Raise the federal minimum wage. Provide access to earned sick leave. Protect overtime pay for millions of workers. Expand the Earned Income Tax Credit (EITC). 41.7 million workers earn under $12 an hour and 58.3 million workers earn under $15 an hour—wages that are too low for families to thrive. Nearly half of all private sector workers lack a single paid sick day. Over 80 percent of low-wage private sector workers do not have earned sick time. Until recently, too few workers were protected by overtime pay rules; expanded protections are currently under attack. The Earned Income Tax Credit fails to reach many of our lowest paid workers, including young adults and workers without children. While the majority of low-wage workers are white, black and Hispanic workers are far more likely to be in low-wage jobs. More than half (53 percent) of black workers and 60 percent of Hispanic workers earn under $15 an hour. For black and Hispanic women, the numbers are even more dramatic. Many low-wage occupations— from restaurant servers to child care workers—are dominated by women. 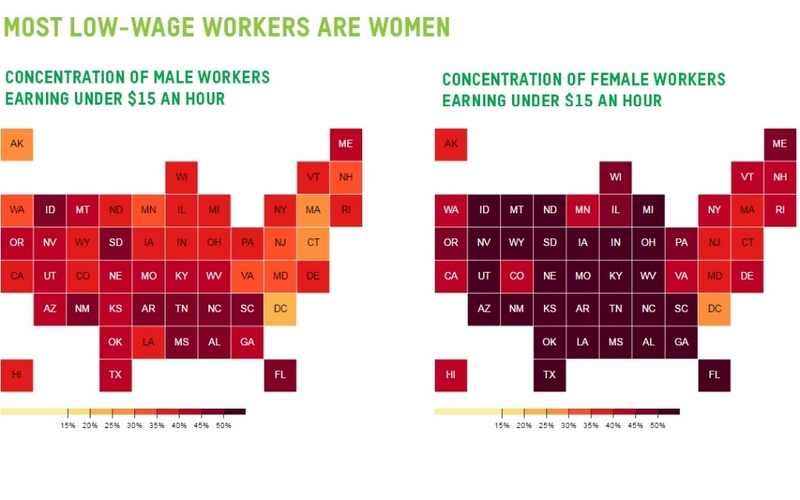 In every state, women make up the majority of workers earning under $12; the highest percentage is in Louisiana (59.4 percent), and the lowest is in California (50.9 percent). Action to right these wrongs would make our economy and our society stronger, healthier, more equitable—and, perhaps most importantly, it would restore hope for the future. Explore the map, and take action by tweeting directly to your Members of Congress and sharing the map on Facebook. Read more in the report, Few Rewards.